card holder or an energy saving switch, installed immediately after the entrance into the room (placing the hotel card into this holder or switch enables electricity in the hotel room). The card reader and the card holder are now available in new colours and can be ordered separately or in a set. The housing of the slimmer NDV-WRFID-B version is made of plastic and aluminium and is available in gloss black with a silver edging. The NDV-WRFID version is programmed with the Andivi NDV-SW2.1 software (software for programming user cards of various profiles: for the reception desk, staff, guests, management, etc. and for monitoring occupancy of accommodation capacities). The card reader can be programmed to accept different cards. The WRFID-k version is programmed with a programming card and offers limited options. Up to 200 same cards can be programmed for this card reader. Therefore, the reader is “locked” only for these cards and does not accept other card profiles. 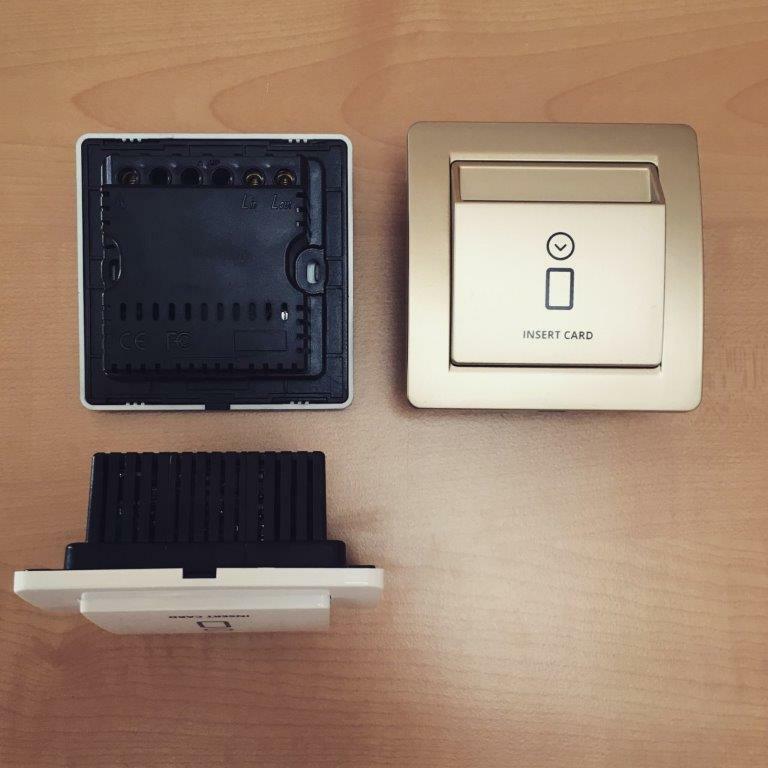 Such card readers are for example appropriate for providing access to hallways in student residences. You can print the number of the hotel room, the hotel logo or any text and symbols on both versions of the card reader or you can decide to leave them neutral and unprinted. 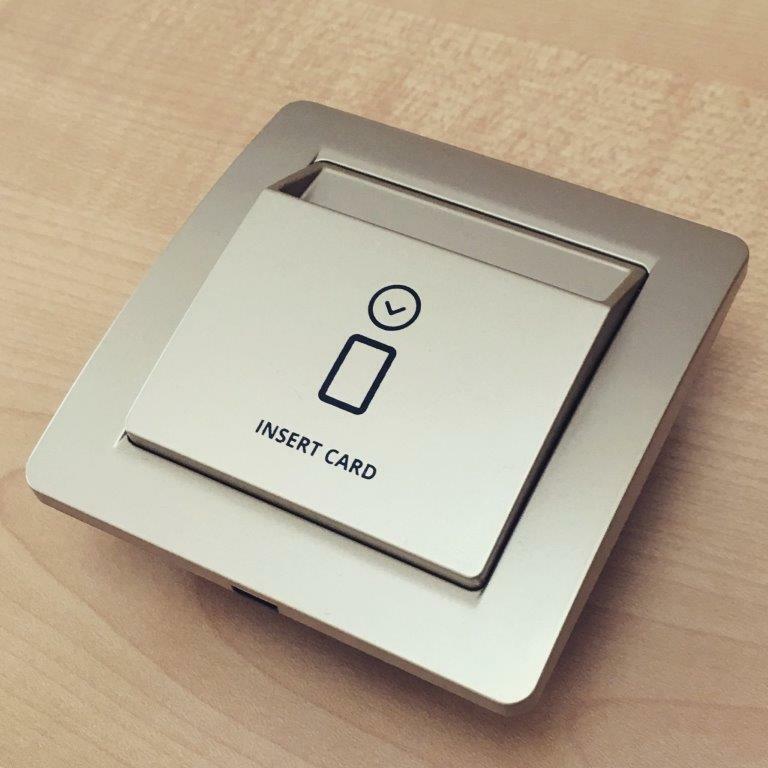 Together with the NDV-PS (12 V) power supply unit and the NDV-ES electronic door lock the card holder is connected into a system for opening hotel room doors. The card holder is a special switch, into which the guest places his/her hotel card immediately after entering the room. This turns on the electricity in the hotel room or changes the thermostat mode from automatic to manual. A few seconds after the guest removes the card from the card reader upon leaving the room, the electricity in the room is turned off and the air conditioning system automatically goes into Economy mode. Saving in money due to automatic optimisation or switching off of air conditioning in the room. Saving in money due to automatic switching off of lights in the room. More safety due to switching off the electrical devices. 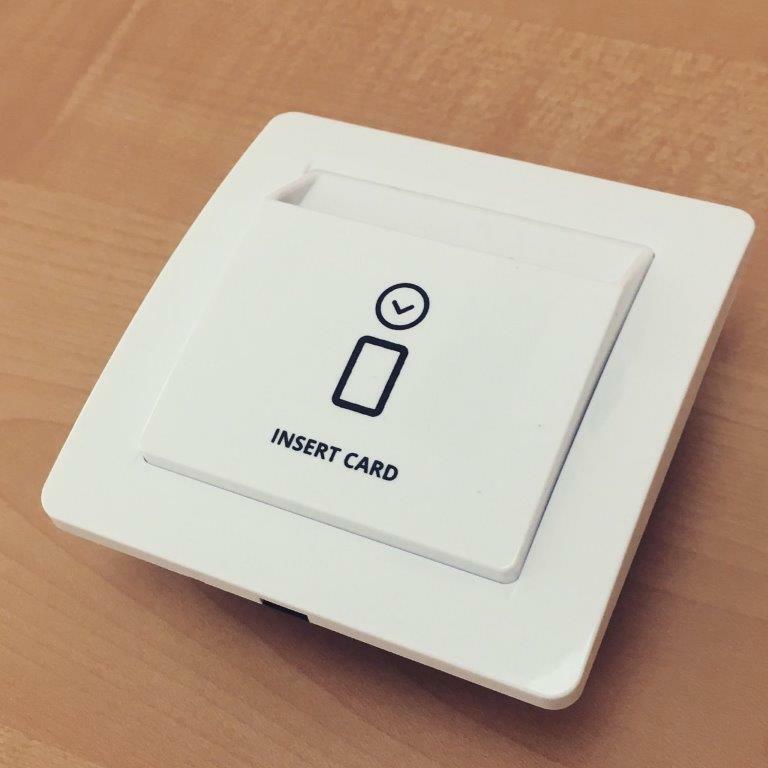 Connected to the thermostat: once the card is placed in the card holder, the room is heated or cooled to the desired room temperature, set by the guest (Comfort mode). After the guest leaves the room, the air conditioning automatically changes into the energy-saving Economy mode. Connected to lighting circuits: once the card is placed in the card holder, the lighting circuits are closed and are not interrupted for some time after the card is removed from the card holder. Therefore, the guest has enough time to leave the room and the hotel manager does not have to worry about the guests unnecessarily leaving a light on. 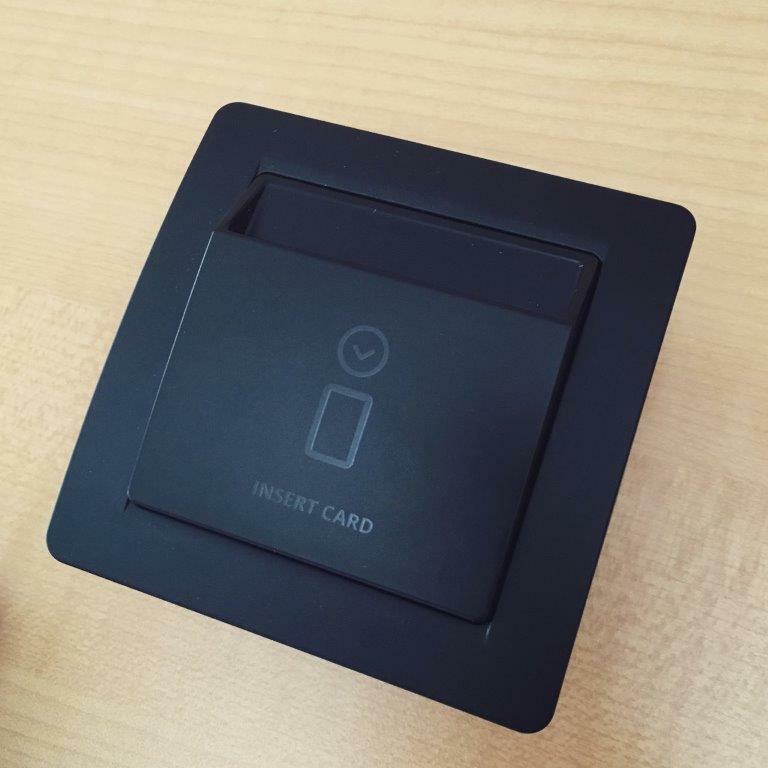 Connected to other power consumers: after removing the card from the card holder, the intelligent room can turn off all unnecessary power consumers (e.g. power outlets in the room and the bathroom). In order not to turn off the devices, which must remain connected to power at all times (mini bar, safe, etc. ), these devices must be connected to electrical power supply separately from the card holder. Basic NDV-ESS1 version: card holders that read all Mifare cards (any Mifare card, placed by the guest in the card reader, will enable the power supply circuit, yet only if it is a Mifare card). Advanced NDV-ESS2 version: card holders that only read Mifare cards that were programmed for this specific card reader or a specific room (only a Mifare card, programmed for this specific card reader, will enable the power supply circuit). We do not offer contact card holders that read all types of cards are, in spite of their very affordable price. Such card holders are easy to trick with and card (plastic card, credit card or even a business card). Such cards can easily be forgotten in the card holder and can easily undo the energy-saving function of hotel room card holders. Functioning: 15 sec. after removing the card from the card holder, electrical power supply is automatically cut off. 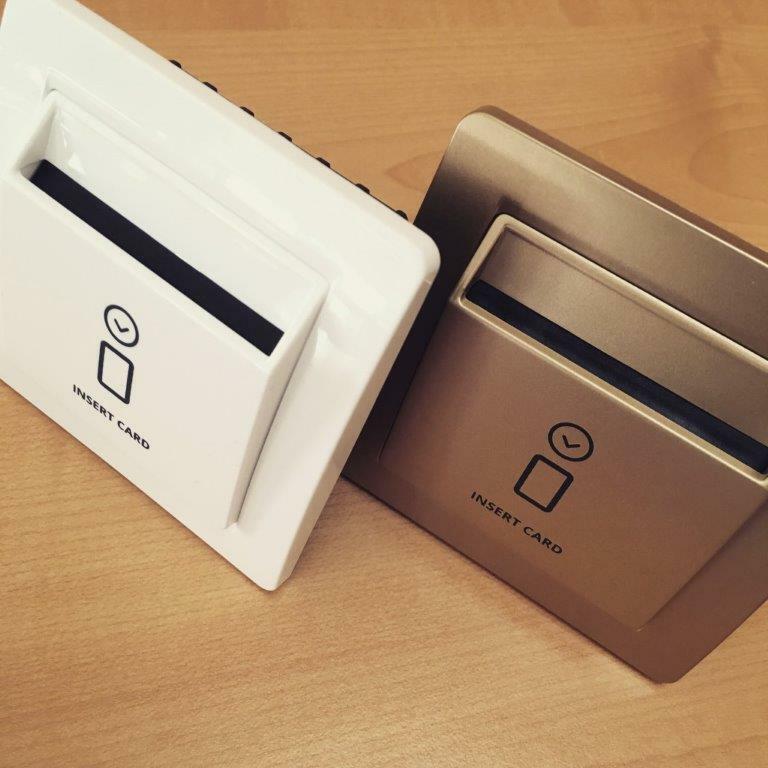 Card holders are standard equipment in hotel rooms and apartment rooms as examples of good practice have shown numerous advantages of their use, especially their energy-saving and money-saving feature. 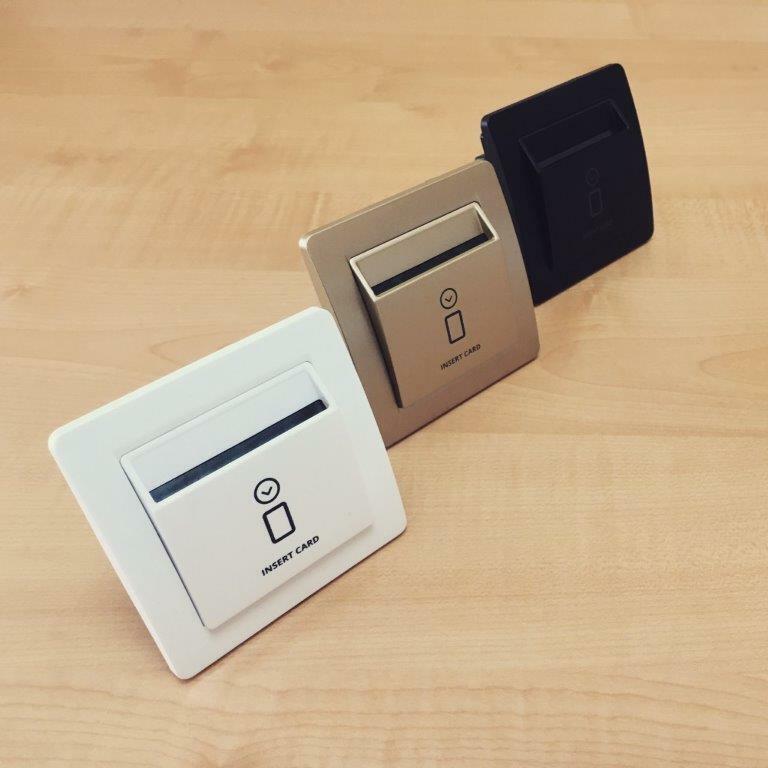 If you wish to introduce contactless access control with card readers and energy saving switches in your accommodation facilities, do not hesitate to contact us at info@andivi.com. PreviousPrevious post:Electronic Hotel Locks: New Models From The NDV SeriesNextNext post:Happy Holidays! !